You dropped your precious smartphone and the screen cracked – great. At least you know you can trust GoMobile Repair Vancouver to come to the rescue to fix your cell. But did you know that we can also help you protect your device AND offer insurance against further damage to your glass touchscreen? Is Your Phone Carrier Ripping You Off? Every day, we see customers walk into our store with a broken phone (hey, that’s why we exist!). But the real tragedy is that often their phone carriers have offered them insurance “deals” for their phones that fell flat on their face upon making a claim. In order to qualify for these bogus warranty programs, customers generally get slapped with a huge deductible ($200 is the norm) and to top it off, they typically have to pay upwards of $15/month to their service provider in order to qualify for the extended warranty in the first place! And to make matters worse, the phones often have to be sent away for repairs and the paying customer is then left without their device for weeks! Sound familiar? We heard enough of this nonsense and we decided to see if we could find a better alternative for our clientele…and one that doesn’t leave them in the lurch when their phone breaks! GoMobile Repair Vancouver is proud to offer you our findings: a liquid glass screen protector that not only hardens the glass on your shiny new (or old!) smartphone but also includes insurance for further screen damage for an entire year! Sound too good to be true? Keep reading – it gets even better! Let’s take a quick look at some of the features of this new miracle product. + Easy application only takes 5 minutes with a DIY rub-on application. + Strengthens the glass on your smartphone up to fifteen times. + Can be applied to any screen, regardless of shape, size, make or model. + Includes 1-Year warranty from WarrantyLife. + Prior repairs via third-party repair shops do NOT void your warranty. + Quick registration can be quickly completed on your device in minutes. We are currently offering two flavours of this revolutionary new product: The first covers you to up to $100 for a repair of the screen on your phone – this option retails at only $39.99! The other option has unlimited value towards the cost of the repair to your damaged screen (Samsung Galaxy owners, we’re looking at you!) and is only a meager $79.99. Considering most liquid or glass screen protectors are $25-30 without insurance options, you’re really only paying an extra $10-40 to rest easy with one year with of coverage. Plus, factor in the insane cost of some screen replacements out there and you could literally be saving yourself hundreds of dollars on your next “whoopsie” moment. The best part is, if you do have the misfortune to break your device with the Slick Gadget Titanium Armor+ applied, you don’t have to be without your phone for weeks on end. Simply come into our shop and we’ll fix it up for you lickety-split with no deductible to pay out. 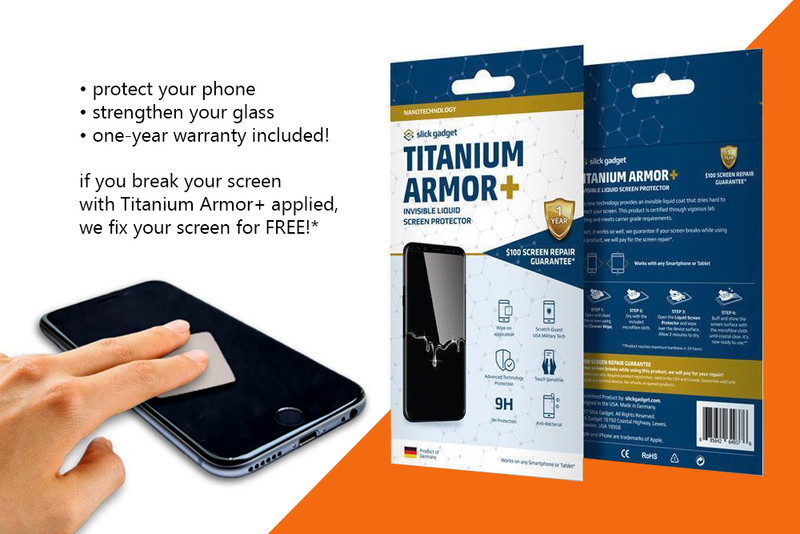 Come into our botique storefront at 245 W Broadway Vancouver today to get your slick gadget protected with the Slick Gadget Titanium Armour+! Warranty Life requires that your smartphone not be broken before this product is applied. Registration must be completed within 30 days of purchase. Repair turnaround in our storefront, although typically very quick (within 2 hours or less), is subject to busy periods and henceforth longer wait times. Furthermore, if your phone is not common like the Apple iPhone or Samsung Galaxy, we may need to special order the part before we can fix your device. We advise phoning us in advance to ensure a quicker turnaround. Please ask our staff whether the $100 coverage or unlimited coverage option works best for your phone. Additional charges may be applied if the damage is not limited to just the glass and/or display or if you have purchased the $100 coverage but have a device that requires a more expensive repair. Previous Previous post: Is the iPhone X Dead? Next Next post: Backup and Restore with iTunes!